The Bay is the Telvanni heartland. 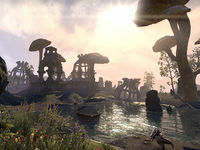 To the east is the island on which is found the Telvanni capital of Sadrith Mora, home of the Telvanni Council House, and also of Tel Naga, home of Master Neloth. Sadrith Mora is a substantial town with a range of services, most notably the variety of magical goods for which the Telvanni are justly famous. Fara's Hole in the Wall is popular with the locals and is located near the open air markets. The island also houses the only center for non-Telvanni activity in the area. Wolverine Hall is an Imperial fort housing branches of the Mages Guild, Fighters Guild, and Imperial Cult. Nearby, Dirty Muriel's Cornerclub provides a halfway house between the Imperial and local populations and is a favorite place for conducting "off the record" business. Another point of interest is the Daedric ruin Kaushtarari on the southeast of the island and a couple of large family crypts. 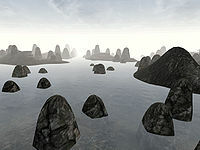 Sadrith Mora may be easily reached by ship or teleportation through the Mages Guild; Silt Striders do not operate here. Along the north of the Bay, the second somewhat small island to the west of Sadrith Mora is the home of Archmagister Gothren, head of House Telvanni. His wizard tower is known as Tel Aruhn. While there is the usual small community at the foot of the tower, services are limited compared to Sadrith Mora, with little competition between tradesmen. There is also a nice little pub. Continuing around the bay counter-clockwise on second island to the west southwest, there is the large Daedric shrine of Yansirramus dedicated to Molag Bal. Adventurers are warned to be careful, as this shrine is frequented by worshippers who do not like intruders. Yansirramus is located near the coast, not far from the cave of Nammu. Proceeding south and back to the east, there are a number of smaller islands and eventually in the southwestern corner of the bay, one comes to the famous home of the Corprusarium, the tower of Tel Fyr and home of Lord Divayth Fyr. There is no transport to Tel Fyr and one must swim to reach it. There are a number of islands between Tel Fyr and Wolverine Hall, which lies to the north-northeast.